The Marshall Stanmore is a unique addition into the Bluetooth speaker world. The speaker incorporates the look of a classic amp and it produces some serious sound. The Marshall Stanmore Looks awesome, it gives you a feeling that you own something special and unique. The speaker comes in 3 different colors, black, brown, and white. The design looks classic and minimalist. It definitely does not look like any other Bluetooth speaker out there and we like that. The speaker feels solid. Wrapped in leather and the grill made from gold colored cloth it just looks and feels great. The only thing we felt could have been done slightly better is the plastic Marshall logo, it feels a bit cheap and flimsy and we think if the Marshall logo could have been stitched in the cloth or something it would have made it perfect but regardless its still great. The top controls add to the speakers retro look with the brass power switch, round metal source/pairing buttons and quality analog controls for bass, treble and volume. The top controls also include 4 small red LEDS for your Bluetooth, optical, Input 1 and input 2 and lastly there is your standard 3.5mm Aux port. The back side of the speaker includes optical and stereo RCA inputs and there is a switch to change from standard to power saving mode. The speaker comes with a 3.5mm audio cable that has great detail and matches the Stanmore character. The Marshall Stanmore is not portable and it does not run on batteries it needs a power outlet. The speaker weighs 13.5 pounds and has a dimension of 15.8 x 11.2 x 9.2 inches and it packs a lot of power into that weight and dimension. 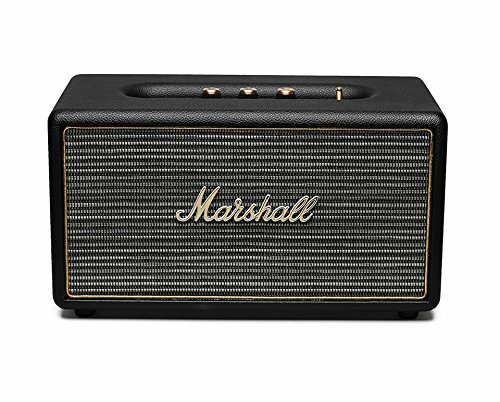 The Marshall Stanmore Bluetooth speaker has plenty of power. The speaker produces excellent clarity with enough bass. The upper frequencies perform well. We found the mid range frequencies to be a tad empty. The bass is solid and the speaker has no distortion. The Stanmore can be adjusted to your preferences with the analog controls for bass and treble. The marshall Stanmore projects sound very nicely and can be heard from quite some distance away and will out perform what you except in speaker of its size. In conclusion the Marshall Stanmore is a unique speaker in the Bluetooth speaker world that offers excellent audio quality for those looking for a more stationary elegant speaker to admire its design and sound.